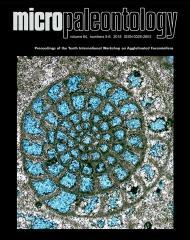 ABSTRACT: Diverse and well-preserved foraminifera are documented from the Sinemurian to Pliensbachian deposits from the Priborzhavske-Perechin Zone in the Ukrainian segment of the Pieniny Klippen Belt. The changes in the smaller agglutinated foraminiferal assemblages are compared with the high resolution ammonite biozonation. The foraminifera are observed in four main facies. In biodetritic marls of the Bucklandi - ?Semicostatum zones a response to increasing low-oxic conditions is recorded. Abloom of small Haplophragmoides spp. predates a barren interval of black shales probably in the Semicostatum Zone that in turn precedes an interval of barren black clays in the Turneri Zone. Above this event the FO of Textularia aff. agglutinans is noted. In the lower part of the Raricostatum Zone a bloom of agglutinated foraminifera and subboreal influx is documented. A rapid decrease in agglutinated foraminifera precedes the Sinemurian/Pliensbachian boundary and continues in the early Pliensbachian Jamesoni Zone. Unfavourable conditions for the agglutinated foraminifera culminate in the Ibex â€“ lower Margaritatus zones and represent an interval barren of agglutinated foraminifera. Impoverished assemblages of agglutinated foraminifera reappear higher in the Margaritatus Zone. The paleoecological interpretations based on morphogroup analysis and the relative abundances of agglutinated foraminifera cast light on paleoclimatic and paleoceanographic changes in the Sinemurian-Pliensbachian stratigraphic record of the eastern part of the Pieniny Klippen Belt.